Nancy Brown is a well respected, Brisbane based artist and printmaker who has worked in the arts industry for many years and has vast experience with a focus on incorporating the printed image, textiles, ceramics and metalwork. 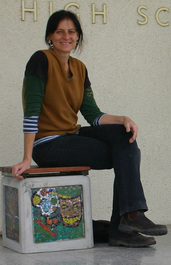 She has participated in numerous community projects, festivals and residencies. We are delighted that she shares her skills in workshops at the Impress Printmakers Studio and is a member of the Impress Printmakers collective of artists. As well as conducting workshops for Impress Printmakers Studio and Gallery, Nancy has travelled throughout regional areas of Queensland and Australia working on diverse projects in communities and schools and with Flying Arts. 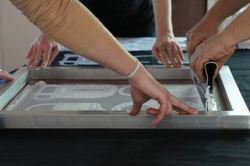 Printing fundamentals: screens, squeegees, setting up for printing, properties of paint. Printing multiples on fabric or canvas. Designing for photo emulsion screens, exposing screens with photo emulsion in sun or UV light to reveal images. printing session: printing images from prepared screens and other work created during day 1.
black and white drawing materials such as ink and brush, pens. ice cream container and 2 takeaway size containers with lids. 2 plastic cake cooking spatulas. 2 metres of material and/ or ready made items to be printed onto at workshop. an apron to wear: the inks stain clothes. packaging tape, eucalyptus oil, dissolvit. additional drawing, measuring and cutting tools and equipment, transparent plastic sheets, black paper, opaque markers and light resistant inks and paints. 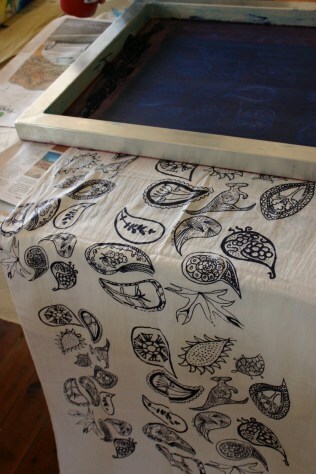 Iron, ironing board, table covers for printing. ​​​Participants are advised to wear closed in shoes, suitable clothing or apron that you do not mind getting ink on. Tie long hair back, wear goggles, masks where appropriate. Follow all instructions given by your tutor during your workshop. ​​To book a place in a workshop, go to the booking form page and follow the prompts to enter in your details, membership status and the workshop you would like to book into. ​June 2017. Courtesy Nancy Brown and Cathy Laqua.